The feature reveals that Shoots built a cabin in the woods and lived with a partner named James Demott. The San Francisco directory as early as 1880 lists Shoots’ address as north side of Ocean House Road, west of the Industrial School [later called the Ingleside Jail, now City College]. 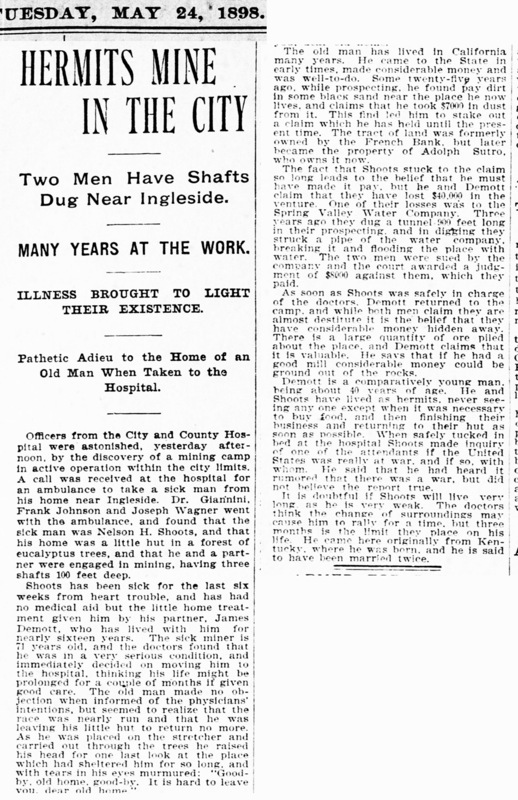 The men dug many shafts—even as long as 900 feet. No one interviewed for the piece had actually seen any gold, but the men appeared to support themselves, and sometimes splashed out at the sordid local dives, so the assumption was they must have got something out of their venture. The mine came to the attention of the general public when Shoots was taken to the hospital mortally ill a few days before the final interview with the dying man. SF Call, 24 May 1898. Read whole article here. Or download an image of article here. Recently I happened upon a map at the California Historical Society archives that noted the locations of two of the mine shafts, giving some concrete reality to the feature in the Call. Map of Forest Tract and San Miguel Ranch showing lands owned by estate of Adolph Sutro, 1910; Map 971, California Historical Society View larger here. The 1910 map shows the “Sunnyside Avenue Extension” (later called Monterey Blvd) in a slightly different location. Other streets are indicated on the map that would never be built. But there are plenty of other landmarks to create an overlay of the present streets. 1910. 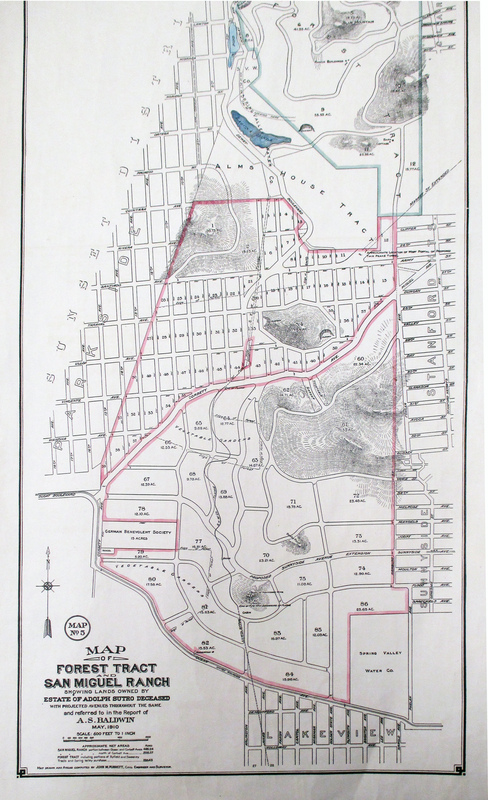 Detail of Map of Forest Tract and San Miguel Ranch showing Lands owned by the Estate of Adolph Sutro. Overlaid to show location of present streets. Mine shafts marked with pink dots. Original map, California Historical Society. 1910. Detail from Map of Forest Tract and San Miguel Ranch showing Lands owned by the Estate of Adolph Sutro. California Historical Society. The map places the two marked shafts in the 800 block of Darien Way in the Mt Davidson Manor neighborhood, just south of Monterey. These would have been dug into the notable rocky hill there. 2019. Rocky hill between 800 block of Darien Way and Monterey Boulevard. Google satellite. The map also locates the cabin, marked with the word just to the south of the shafts. If accurate (and that might be a stretch) it would have stood in the middle of the 100 block of Upland Drive. The entire area was heavily wooded with the eucalyptus trees that Adolph Sutro planted about 1880. 1910. View of Sutro’s Forest, looking north from the present Ingleside neighborhood. Approximate location of Shoot’s mining camp marked with pink dot. Ashton Avenue on far right. Ocean Avenue formed the southern edge of the forest, foreground here. Mount Davidson in distance at center. Image courtesy the Sutro Library. View larger. SF Call, 13 Jun 1893. The Sutro Estate map also shows the location of Spring Valley’s 30-inch pipe bringing water up from the south to Laguna Honda reservoir. At about the location of the marked shafts, the pipe (dashed line) transitioned into an open flume, an above-ground wood conduit (solid line). 1910. Detail from Map of Forest Tract and San Miguel Ranch showing Lands owned by the Estate of Adolph Sutro. Spring Valley Water Works pipe indicated in original map. California Historical Society. During his mining, Shoots apparently broke the Spring Valley pipe, flooding one of his shafts, although his story was that the pipe was leaking first. So he decided to sue Spring Valley, to the tune of $130,000 ($3.6M now), declaring his mine was seriously impinged upon by the presence of the water. The judge disagreed, and awarded Spring Valley $8000 ($170K now) damages. In the deathbed interview, Shoots states that he paid the judgment, another indication that there was something of worth coming out of his mine shafts. Nelson Hundley Shoots was born near Lexington, Kentucky, in 1825. He attended the Platteville Academy, at least in 1847, in Platteville Wisconsin. This educational institution later became the Wisconsin Institute of Technology, and then University of Wisconsin Platteville. The school was formed in the wake of prosperous lead-mining there in the mid-1800s. Unlike some mining towns in the West that were eventually deserted, the success of mining operations in Platteville gave rise to a well-organized thriving town as mining waned. Shoots seems to have gone to Wisconsin without other family members, the first of many moves he made—an ambitious, or perhaps restless, man. In any case, he studied in the English Department at the academy. Shoots in his final interview says he married twice, and there is at least one marriage in the public record; in 1849 he was married to a woman named Susan in Wisconsin. But later he seems to have divested himself of her and his second wife as well. He came to Sacramento at least by 1866, working as a miner. That doesn’t quite qualify him as a “pioneer miner” as the SF Call article designates him, though he did arrive was before the transcontinental railway in 1869. Sometime in the late 1870s, he came to San Francisco. Shoots picked a solitary and secreted location in Sutro’s forest. He may have begun by mining coal. He was not a squatter—he probably leased the land from Adolph Sutro, who himself mined coal at Land’s End (at least in 1891). Working sand for gold dust at Ocean Beach in San Francisco had a long persistent history. Men regularly set up operations along the beach to extract gold from the magnetic black sand. There were waves of interest in this pursuit – in 1878, 1884, 1894, 1900 – even as late as 1930. SF Examiner, 10 Feb 1900. Besides the laborious work of extracting gold from sand, there were other gold-mining operations besides Nelson Shoots’ in San Francisco over the years—though none that lasted as long as his efforts. Read an excellent account of these in this post on Evelyn Rose’s Tramps of San Francisco blog. Gold can be found in many types of geological formations on earth, but the question is always whether it is worth the labor of getting it free from the rock or sand. But Nelson Shoots was playing a very long game with his mining—over seventeen years—so perhaps this was never a consideration for him. He built a cabin in 1880 and got to work, taking on his partner James Demott a year or two after that. The matter of extracting the metal from the ore was a subject of widespread speculation. “They didn’t get the gold out in the usual way,” said one old-timer in the district, “It’s my opinion they found gold in a certain kind of rock and in small nuggets. In this way they could take out quite good-sized piles and nobody ever the wiser….I have known of similar cases, I used to mine myself…along the Sacramento [river]. A young fellow…went to work in an old shaft and took out considerable metal. Nobody could ever tell how he did it [or] find any gold. Nobody ever could but him and he always found plenty.” Plenty of myths and stories around mining. What is sure is that Shoots did not have one of the big engine-driven mining mills that were at that time allowing mining operations to extract ever smaller particles of gold from ore. Inventor William A Merralls, who built the Sunnyside Conservatory, had a successful business marketing his milling machines in San Francisco. The Call reporter tells his readers what he found when he left the hospital and visited the site of Shoots’ cabin in the forest, where a primitive but “cozy” life was revealed. Chained dogs and hungry chickens greeted him. There was no sign of Demott, and the lock on the door was covered in cobwebs. The money for his funeral was given by an invalided Civil War veteran named Charles E Greenlow, about whom I could find almost nothing, nor any tie to the reclusive Shoots. Perhaps Greenlow, who received a pension from the US Government, read the account in the paper, and was moved to offer this grant to provide for Shoots’ burial, which suggests that Shoots had very little left in his kitty by then. 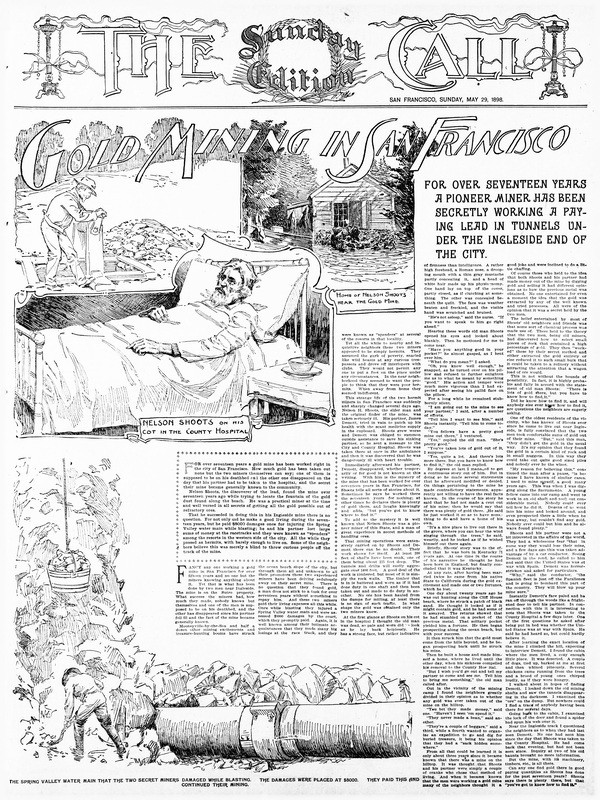 In a year when tens of thousands of men left for the Klondike territories in Canada in a huge, well-publicized gold rush, the notion someone was mining inside the San Francisco city limits was likely to have provided an amusing and touching Sunday long read for many. Read the entire deathbed interview and account of Shoots’ life in the SF Call here, or if that doesn’t work for you, download an image file of it here. Excellent work as usual Amy.